Welcome back, financiers and non-financiers alike. In last week’s article, we discussed what the definition of a “fake bulk rare” is, why it’s different than true bulk, and what you should do with cards in the category. I’m relatively proud of it as I think it’s an under-explored area in our little MTG finance alcove, so be sure to check it out. I’ll continue to hold this awkwardly conversational writing style with myself until you get back. Have been holding on a set of Commander 2013 for about two years now and realized that the price isn’t moving up at all, with only a handful of staples in the decks that are worthwhile to keep. Also, have not found any luck finding buyers for these at discounted prices, even. 1) Should I crack these open and sell them individually to at least recuperate some cost? Seeing more Commander products being printed every year, I am not confident any of these will go up any time soon. 2) If I were to crack one open, it would probably be for play. Which of these are best for a beginning player of EDH to delve into? If you’ve been following my content for a billion years or so, you might remember that I used to write for Brainstorm Brewery. In particular, about a year and a half ago, I wrote an article about my own personal errors that I made when it came to investing in sealed product. Since the information in that article is pretty outdated (and poorly formatted), I’ll save you the trouble of reading it. The short version is that I made a mistake investing into sealed versions of From the Vault: Twenty and Commander 2013, when I could have capitalized on the huge spike of Legacy staples like Rishadan Port or Tundra. In that article from August 2014, I said that I would be in for the long haul when it came to my sealed product. I had no need for emergency funds and owned plenty of extra copies of the cards that came in each of those sets. I would just continue to leave them in their plastic totes to collect dust, and remember that I owned them if someones asked for an easy way to get into the Commander format. If I happened to run out of Jace, the Mind Sculptors that I had in stock, I could crack the FTVs and just fill my binders with some of the higher-end stuff, throwing the chaff foils into my dollar boxes. Only a couple months ago, I decided to crack open a decent portion of my sealed product (five FTV20s, and fifteen C13 decks) to help replenish some of the cheaper cards in my display case, in addition to filling a local order for a playset of Jaces. There was still no movement on either sealed product, and I was obviously never going to realistically move them while still packaged unless I wanted to lose out on a huge chunk in shipping. Our Redditor produced a couple of solutions (well, pretty much the only two possibilities) themselves, so let’s go over those in detail. Crack it all. I kind of spoiled the ending a little bit, as this is obviously the move I chose to make. The cards had been sitting in storage for two years, doing nothing but taking up space and money. I finally got a request for a few individual cards that I didn’t otherwise have, so I filled those by shredding my sealed product for parts. This player is actually, well, a player, so I think they’ll get even more value out of learning the format with their preconstructed decks. Nobody ever accused the Nekusar deck of being underpowered, and you can certainly still trade the True-Name Nemesis toward upgrading whatever deck you decide to stick with. Let it sit in the oven for a while longer, and accept the fact that these are basically never going to appreciate in price. Let’s get this statement out of the way right now: It will be several years before Sol Ring is ever worth more than $1.50, especially if they continue to print the card in the every yearly Commander set, encouraging its ubiquity in the format. 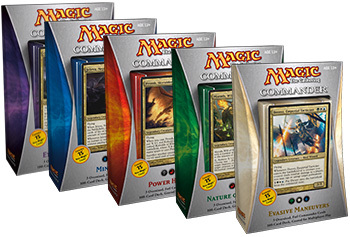 A lot of us (including myself) incorrectly assumed that the Commander sets would be a continuous gold mine of value, following the trends of the first set in 2011. We were wrong. Wizards has learned from its mistakes. Remember these? Back in 2012, these were the go-to slam dunk for sealed product. Shock lands, Abrupt Decay, Deathrite Shaman, all at rare. If you wanted to make a 30-percent increase over a three-to-four-year period, this was what people like me would tell people like you to buy as a safe and solid investment. Now you can find them for almost 20-percent cheaper than they were back when Obama won the election for his second term. Sealed product is was attractive to us because it required a very minimal amount of effort. You threw money at it, moved your girlfriend’s shoes around in the closet, and deleted the memory of buying it from your mental hard drive. Four years later, you’re supposed to dig it up like a lost treasure, making a significant return on your investment by popping it up on eBay or Facebook, selling to all of the nostalgic players who want to reminisce about their favorite draft format. I’m here to remind you that the era of making money off of any random sealed product is long gone. 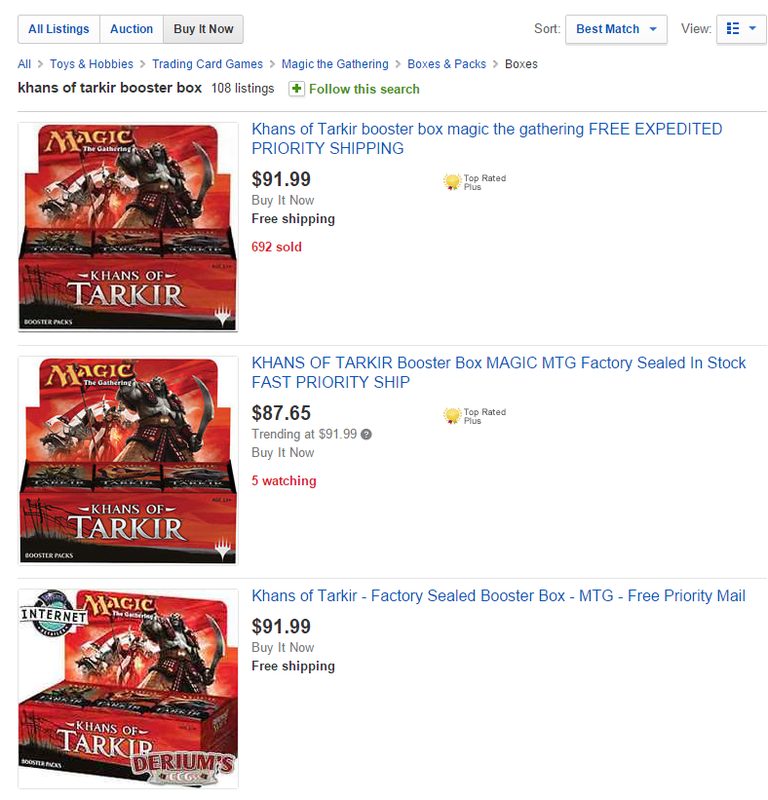 Even today, I see posts on both local and non-local Facebook groups, asking the masses, ” What would the best sealed booster box be to invest in?” I see a ton of replies suggesting that you can’t possibly go wrong with Khans; you get fetches, you get….. uhhh….. uhhh…… foil Monastery Swiftspear? Will these be $80 in three years? So what could you get instead of a box of KTK, that has a higher likelihood of giving you a return on investment in a shorter period of time? Well, you know, speculating isn’t my personal preference for putting money into Magic, but let’s put on our spec caps for a minute. If you really want to burn through that $90, I’ve got a couple of suggestions. You can buy Remands on TCGplayer for $4.50, NM with free shipping. Seriously, that’s a thing. Remember when these were $15 not too long ago? 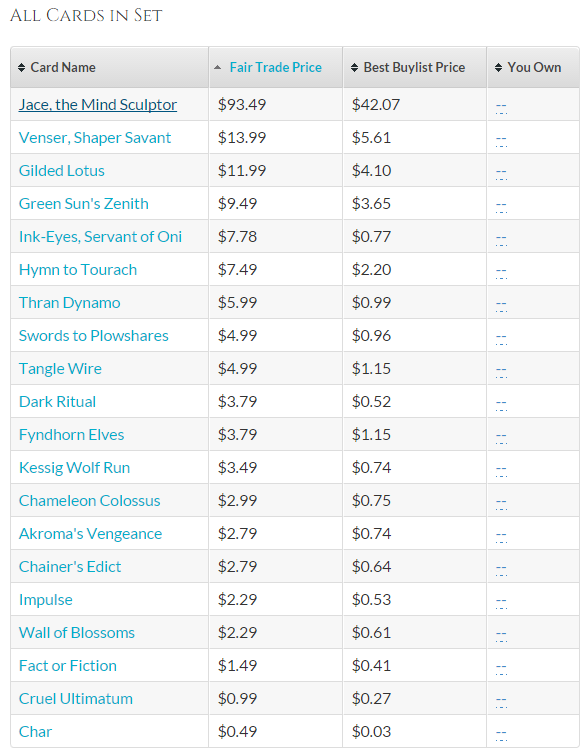 To make it even more appealing, the buylist prices that vendors like ABUgames pay are close to $3, making the spread relatively low for a cheap modern staple. 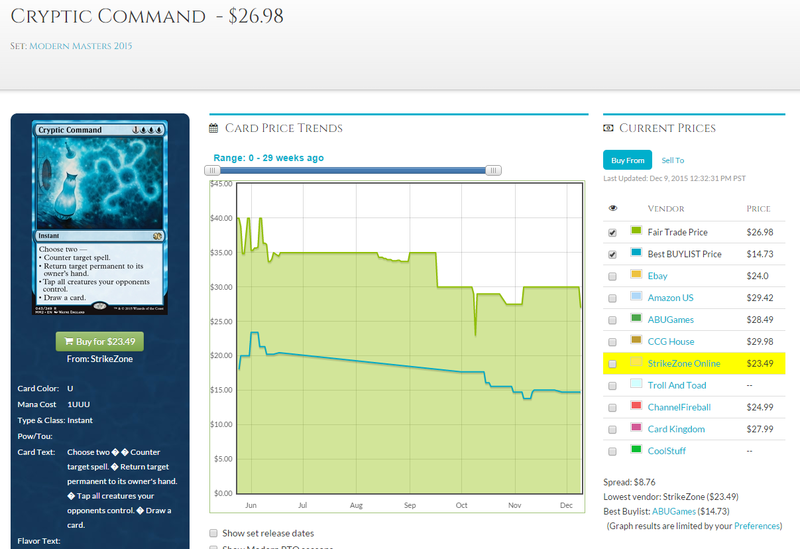 Cryptic Command has followed a similar trend, hitting its all-time low yesterday (and today, and probably tomorrow…). You know that my strategy is “never buy Magic cards at full retail,” but I just have a bad taste in my mouth when I personally sell Remands at $4. I’m holding onto the rest of my copies until Modern season hits, because I think these creep back up to at least $7, maybe $8. 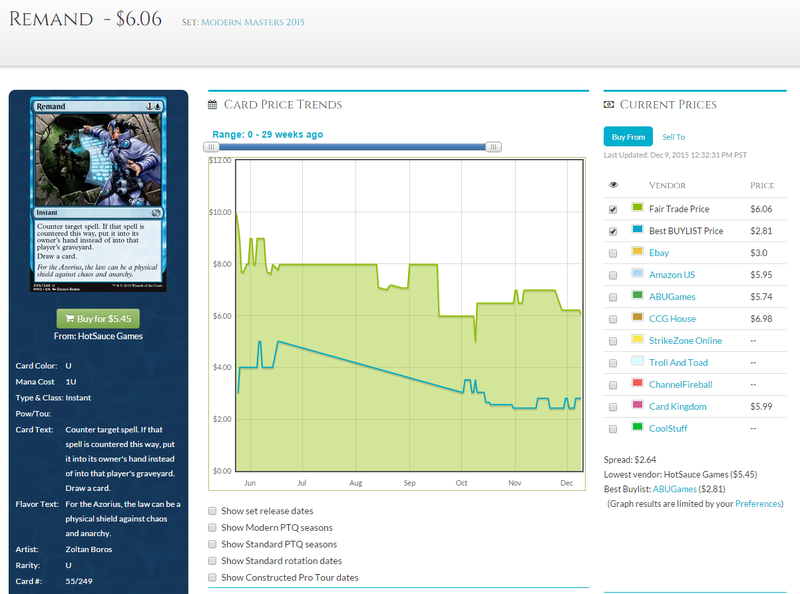 Cryptic could hit $30 to $35, which is certainly a better ROI than a box of either RTR or KTK. In other news, Stoneforge Mystic is the next Grand Prix promo. Someone on this website who cares a lot more than I do will probably write about that. 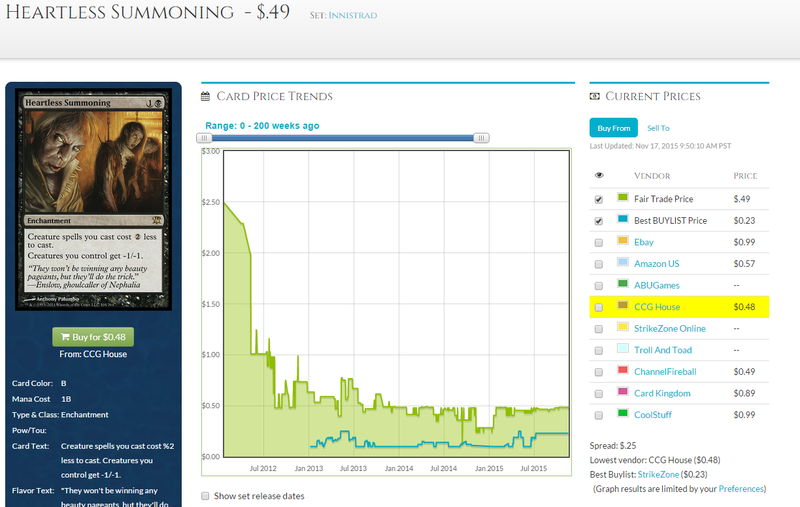 Awakening Zone has moved up almost 25 percent since I wrote about it last, before the Battle for Zendikar set release. It’s certainly had a stronger track record than From Beyond. I still wouldn’t touch From Beyond at $1—I think A-Zone continues to be a better train to hop onto if you really need copies for EDH. I really enjoy writing these personalized response threads, because I know for a fact that my content is helping at least a few specific people in particular with their questions about Magic finance. If you weren’t around to read the first two articles where I answered questions from Reddit, then feel free to do so. I mean, I’m not sure if the answers to those questions are still relevant two months later, but they should at least make for some decent reading material if you’re bored. 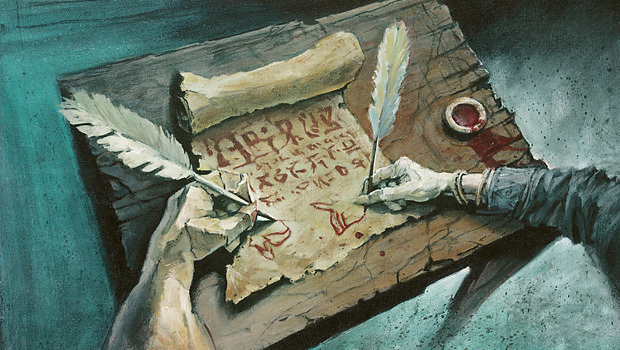 Hopefully next week, I’ll be back with a more comprehensive article on collection buying, since that appears to be my niche among MTGPrice writers. Griselbrand GP promo. It’s played in Legacy, modern and has a lot of casual appeal. It’s down to 13 and I think I can pick a number up for 11. Worth buying into or wait a couple months yet? The regular foil is at 60. I don’t think the promo Griselbrand is the best pickup you should be aiming for right now (unless you happen to need copies for personal play, in which case I don’t think you need to wait for it to drop any further). The supply on these is absolutely huge, and I think people often forget that these are still being given out! There will be over a thousand more copies added to the pool this weekend at GP Pittsburgh, and I don’t think the casual appeal on this is as high as you suggest, partially due to his “banned in Commander” status. If you’re looking for safe Modern-legal investments, I would turn your attention towards Modern Masters 2015 cards that have been suppressed over the summer and fall, and will continue to dodge reprints through next year. We’re not opening anymore of that set, and we’re almost guaranteed to see cards like Remand that have hit an all-time low start to creep back up. I also wouldn’t hate you for picking up Fulminator Mage, Mox Opal, or Cryptic Command. I pulled an Arid Mesa Expedition (currently @ $105) and a Sacred Foundry Expedition (currently at $65). I’ve watched the Mesa climb from mid 70s to the current price. My question is, how long should I hold on to these guys? They’re only going up, right? 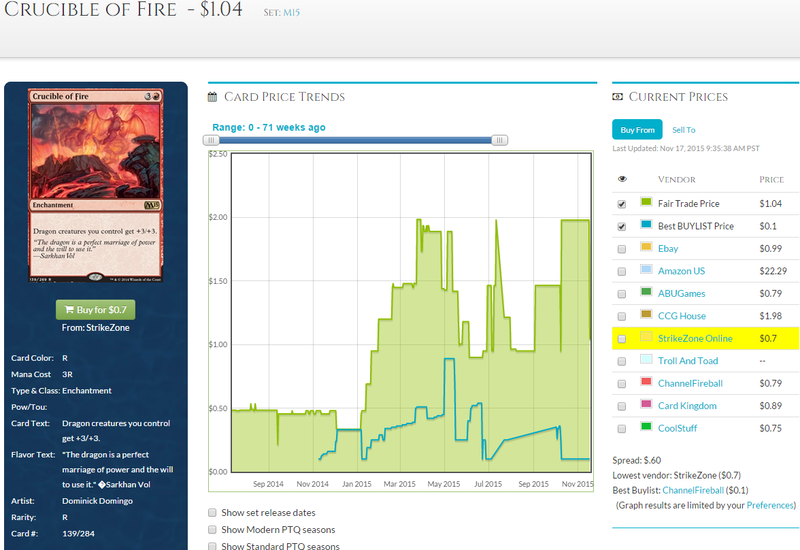 Expeditions lands have definitely settled down over the past month, although I don’t recall Mesa ever being at $70. If you’re someone looking for pure finanical gain, then you’re correct that I think these can only go up in the long term. However, that long term is, well, a very long term. I expect these to slowly creep up over years, not weeks or months. If you’re a player who is on the hunt for pieces to decks, then I can only recommend trading or selling them to help you play Magic. If you’re looking to get into Modern, these two lands can help to put a decent dent in some of the higher-dollar cards that you probably don’t want to shell out pure cash for. The Foundry can turn into a set of regular Foundries plus $15 in other random goodies. The Mesa can split itself into two Mesas plus some other small stuff. There’s probably someone at your LGS who is hunting these down and has a fully stocked trade binder for you to go digging through that you normally wouldn’t have access to without these kinds of cards. If you care about trying to build a deck, I think these are your ticket to help with that. If you’re not planning on playing anytime soon, they should be considered reasonably stable holds. I was thinking of snagging a couple boxes of Khans to hang onto, as I imagine they’d go up in value due to the fetch land content. Is this a realistic Idea, or would I be better off buying fetches and letting them go up? Not to go too deep into the time machine, but one of my favorite articles that I wrote back on Brainstorm Brewery was about investing in Sealed product, and how it’s really not what it used to be. Return investment on boxes of RTR have been, well, lackluster to say the best, and that was three years ago. The TL;DR of the article is that other than novelty product like the first-ever Commander set, I really don’t think we can expect the return on investment for fall- or spring-set booster boxes to be what it used to, like with Zendikar or Scars of Mirrodin. You’d be waiting three, maybe four years to get a return of 20, maybe 30, percent and then what? Selling them will be brutal with all of the shipping costs. I really think you’re better off looking into single card specs at that point, although not fetches. They’re currently too high from their ubiquity in Standard. If you’re looking for card specs that have the potential to span over several years, you can continue reading and we’ll get to that in just a bit. If you’re looking to hold onto the boxes for three years and then have some booster drafts with your friends down the road for nostalgia, then my advice is a bit different. I’d tell you that you can find KTK boxes for around $85 on Massdrop. If you can’t wait patiently until the next drop becomes available, you can find a local judge who’s willing to sell you his box that he received for judging an event, or until you find a lucky deal on eBay or something. I wouldn’t feel like you have to run out and buy it right now is the point I’m trying to make here. Lastly, we have a question on cheap cards to invest in that have the potential to show a lot of growth very suddenly, from dbchiu. Okay, so maybe he wanted to know more about Pauper picks, but he didn’t ask that specifically in the question, did he? Eh, I’ll use any excuse to talk about bulk rare penny stocks. Instead of Pauper penny stocks that you may or may not have a hard time getting rid of to a large crowd, I love setting aside certain bulk rares that I pick up for a dime a piece. Eventually some of them pop, like Spoils of the Vault earlier this year. More recently, Kabira Evangel and his other ally friends from Zendikar gave me some pretty ridiculous percentage gains. In terms of risk versus reward, I absolutely love cards that just have that sense of “this could be broken if the right card is printed.” At a dime each, you can’t really go wrong. 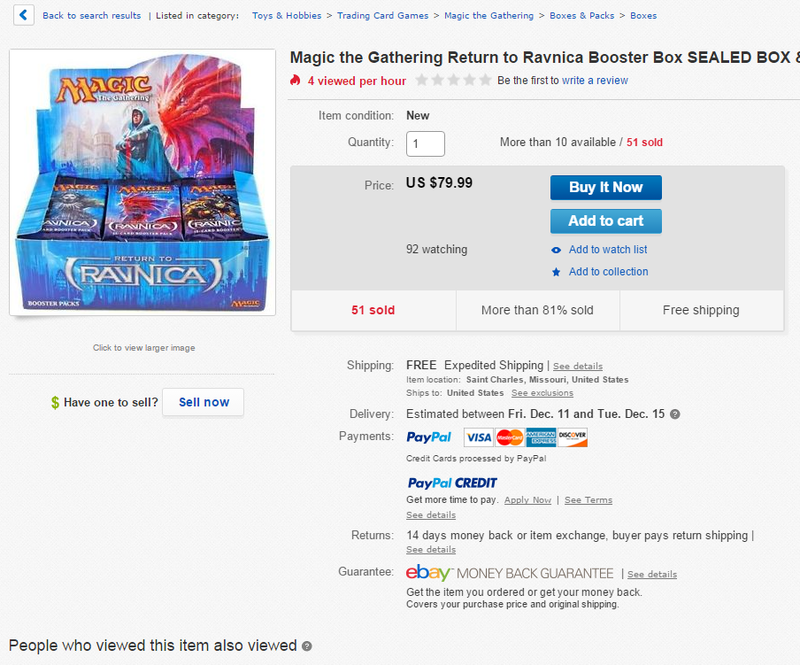 The worst case scenario is buylisting back to a large vendor at a Grand Prix, or shipping them to someone like me who wants all of your bulk rares. Okay, seriously. Someone has to break this eventually. It has so much potential, and just screams combo. Once a proud $6 card, now reduced to a mere bulk rare. This one’s less of a “combotastic Modern sleeper” and more of a “non-competitive slow gainer over three years,” but I’d rather have 1,000 copies of this instead of a booster box of Khans of Tarkir any day. Even if I wait two years for a slow gain back up to being buylistable at 50 cents, I’m perfectly fine with that. Normally this is where I give you some random small tid-bits of information that I realized at some point throughout the week, but I’m not sure I have anything today. This coming weekend is Grand Prix Pittsburgh, and you might see me there. If I do decide to go, I promise I won’t write about it for next week. I’m trying to think of a topic focusing on collection buying that I can hone in on, so if you have any suggestions or requests, then I’d be glad to hear them! Hit me up on the Twitter or Facebook, or in the comments section. Have a great week! So my articles are tossed out into the wild of the internet for all to see on Thursdays, right? Well, that means I sit down to write them on Tuesdays, usually at 11:00 p.m. in a hurried rush so that I can get enough sleep for class the next morning. 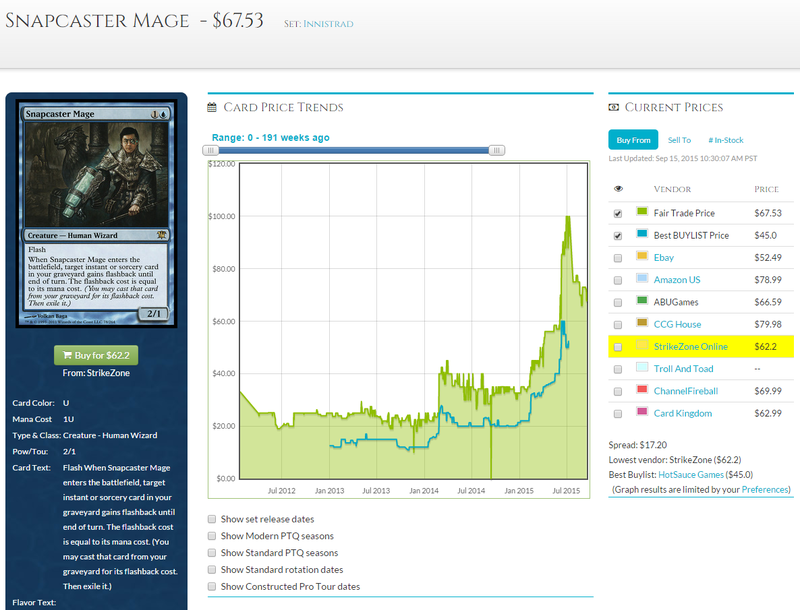 On Wednesdays, the /r/mtgfinance subreddit posts an AMA thread where new players and budding financiers can post questions relating to card prices or market trends, no matter how specific or weird. I’ll link you to the one from September 9, 2015, right here. I have a tendency to browse through the thread every week, often trying to find something that I can configure into an article, unless I already have something at the ready. I’m assuming that you guys don’t really want to read yet another installment of, “Here’s this collection I bought, this is how I’m going to organize and process the whole thing, and this is how I plan on selling all of the different pieces of it.” I mean, if you do want to read more of that, then please let me know. It’s kind of my niche on this website, while Jason pleasures himself to the number 99 and Travis buys out the internet of Dragon Whisperer (hint: there’s still time to buy that card, and there’s a reason that SCG is sold out at $3 right now). Assuming that you didn’t want to read more about my collection-buying exploits, and recognizing that Reddit is a good place to search for ideas, I went fishing. The thing is, I couldn’t find one specific question on the subreddit’s weekly AMA to constitute writing an entire DJ Johnson article. I’m determined to make this work, though, and I noticed that there were a decent number of cold, abandoned, answerless questions lying around on the thread. I’m going to use this week to answer several of those inquiries to the best detail of my ability, and then message this article to those Redditors who asked the questions. Can You Make Change for a Canadian 20? Even if we ignore the garbage towards the bottom, we still make out better by moving the top five or so cards through TCGplayer, Facebook, or a similar out. You’ll almost certainly pay less in shipping as well, with Jace being the only single I would ship with tracking in a bubble mailer. To answer your question, Hiroshimarc1, I wouldn’t sit around expecting FTV:20 to continue to grow in value. You’ll waste a lot of time sitting on gains that don’t exist, or you’ll suffer from very, very small marginal increases at best. I recommend cracking your FTVs and selling the singles inside. The higher-end stuff will move a lot faster, and you can ship the cheaper stuff to buylists to recoup the cost. We both lost on this one, but it’s better to try and recoup your losses instead of sitting on dead weight. Thanks for the question, Farsho! As of right now, the total Puca value of what you have is 6150 points, and the 3 Polluted Deltas will run you about 7122 points. I hope you have some extra points to push towards the Deltas, otherwise you won’t have enough. I definitely support trading the two Guides for three Deltas, for multiple reasons other than it just being a good trade for value. Right now, you’re not using the Goblin Guides for anything else (at least I assume so from your post). Even if the lack of a recent printing means they will marginally increase in value by a couple of dollars over the next month or so, is that really worth not being able to optimally play your UR Delver deck with the Deltas? If you’re a player, there’s an inherent value in actually being able to, well, play your deck. Even if the Guides were $37 each and beat out the Deltas in pure TCGplayer mid value, I’d recommend trading cards you’re not playing for cards that you will play. Neither card will see a reprint anytime soon, unless WOTC really surprises us. Well, hey there, gravitygroove. By the time you’re reading this article, your comment will be at least four days old. Getting a case at 540 seems like a perfectly fine deal, considering we’re seeing a lot more hype for whole cases with this set. We can give thanks to the Zendikar Expeditions lottery for that, bringing approximately one golden ticket to every six boxes of BFZ. Personally, I really don’t think you want to hoard them. I went over a few of the reasons that sealed product is problematic back in the first question, and sealed booster boxes are even more of a pain to move than From the Vault product. They weigh more, and it’s harder to find that one guy looking to crack them for drafts a few years down the road. In addition to that, we really haven’t been seeing the returns on sealed product that we used to. Remember that Expeditions cards will likely water down the rest of the set, simply by flooding the market with non-Expeditions stuff. 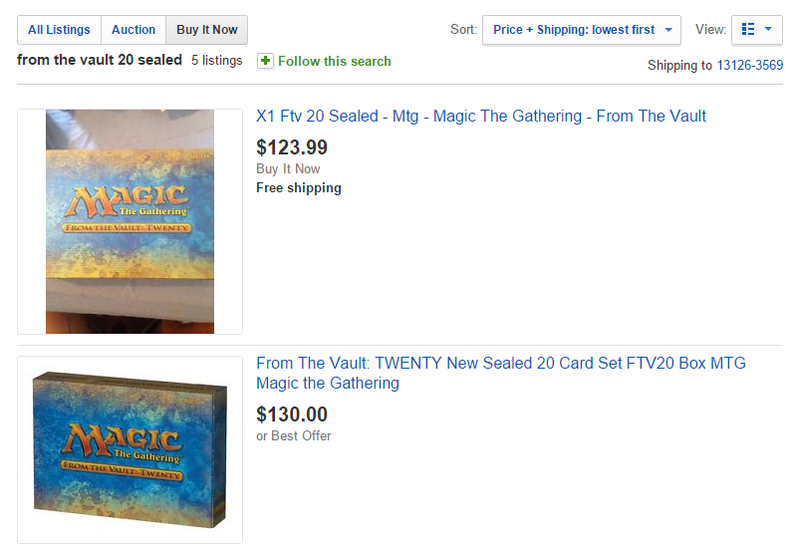 Vendors will be cracking hundreds and hundreds of these cases, looking to complete playsets of those full-art lands. You’re one small case in a large ocean of vendors, so these cards will be on the market for years to come. I really don’t think there’s any value to be gained on stashing a $500 investment that also takes up a non-zero amount of closet space, when we don’t see clear signs of significant returns down the road. If you’re looking for a quick flip, you might have some luck selling individual boxes locally at $100 to $110 each, especially if your LGS runs out of product on the weekend of release. That would net you a $60 or $70 profit with almost no work involved—you would just get to be the middle man. However, if you’d rather get that high from cracking packs and sitting in a pile of bulk commons/uncommons, tokens, and booster pack wrapping, there is a third option. Cracking everything and moving it as soon as possible is a way to get value, but it’s obviously a gamble. Opening that $200 (or more?) Expeditions Scalding Tarn cushions your case cost by a significant margin, but opening one of the new BFZ duals will leave a bad taste in your mouth. If you’re fast and efficient with how quickly you move a lot of the mythics, rares, and uncommons before they plummet to their bulky graves, it’s not out of the question that you could recoup 80 or 90 percent of the value of each box, or even come out ahead in the long term. Users bananaderson and Marcoox here are both on the same page, and are wondering what the likely price trajectories are for Eidolon of the Great Revel and Thoughtseize, once they leave Standard and head off into the world of eternal-only play. 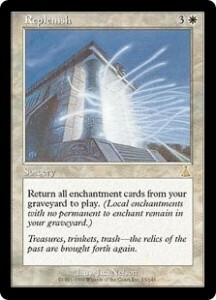 For cards like these, I like to use the good old analogy of Snapcaster Mage. Snapcaster didn’t plummet at rotation. He may have dipped by a dollar or two if my memory serves, but he certainly held his value as he made the transition to the world of eternal. Everyone knew already that he would find homes there, so a large majority of Standard players kept their copies because they knew that they would continue to find use for them. Thoughtseize and Eidolon will likely follow a similar pattern: they’ll barely (if at all) drop when they rotate out of Standard, and will continue to hold their own or increase as time goes on. If you need either card for a deck, either now or in the near future, I recommend biting the bullet, taking that shock to the face, and buying in or trading for them right now. Some of these questions had a bit more of a “Finance 101” feel to them, but I think that’s alright. I enjoy answering these questions, because it reminds me that while it might seem “easy” or “obvious” to me, there are still newer players and growing financiers who are still just starting to explore the world of Magic finance that I discovered several years ago. Maybe I’ll turn this into a semi-regular thing, using the Reddit thread as a solid crowdsource for specific finance questions that I can answer in an article. At the very least, it gives me something to write about every week. 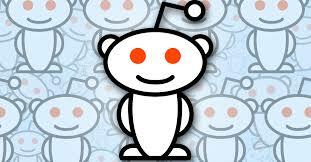 Hit me up on Twitter, Facebook, or Reddit if you want to talk, suggest a topic, or provide constructive criticism. Oh, and the comments section exists, too. Use it.